Introducing, Sally Hansen's Head Bang - from the Miracle Gel seasonal (Fall/Winter 2015) collection, a cool-toned, dark mushroom, chocolate brown. I have been smitten with this nail color ever since I first came across it. At first I convinced myself that I did not need another mundane chocolate brown from yet another earthy fall/winter collection, especially a pricey one ($7.99 - $9.99). After seeing this color pop up on my radar while picking up some milk at the grocery-store and during a coffee-date with one of my best friends, Megan, at ULTA, I came to the conclusion that Head Bang was no ordinary brown nail color. Eventually, I purchased it at my local Bed, Bath, & Beyond, using a 20% off coupon, which justified my purchase even more. I have nothing like Head Bang in my nail polish collection. As you can see from the pictures, there is something about this color that is different. It draws my attention, almost as if it catches me by surprise and I find myself admiring Head Bang's subtle uniqueness. I think it is the first cool-toned, deep mushroom, chocolate brown that I have come across, which is not too purple or too gray or too dark. The first coat is a bit thin so I recommend using at least two coats or three, if you are a perfectionist. It is not very messy or difficult to do three coats because the polish layers nicely without bubbling up or streaking. Although I only wore this polish for about five or so days, it only chipped on the index fingernails. I am not one to keep my nail polish on for longer than four or five days because one, I find it boring, and two, shabby once chipping has occurred and natural nail growth is visible. Overall, Head Bang is a must-have! Not only is it a stunning color, but a trendy one as well. Brown is such a happening color at the moment in the beauty world, especially brown lip colors. 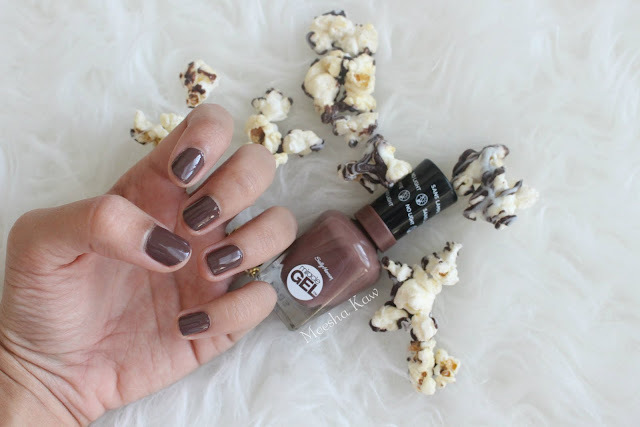 So what's not to like about a chocolate brown nail polish to pair with your favorite chocolate brown liquid lipstick. I have received so many compliments on my nails while wearing Head Bang. I hope Sally Hansen adds it to its permanent collection or that y'all can get it before the seasonal displays disappear. This color is so so gorgeous, especially on you! I can see it working well with anything! Happy New Year's!